As most of you know me, I'm an avid, no, rabid gamer. I love all types of games, from sitting down with a regular deck of cards and playing gin to complex board and card games, to video games (still going through Star Wars: TOR withdrawl from the free beta weekends as I type this). 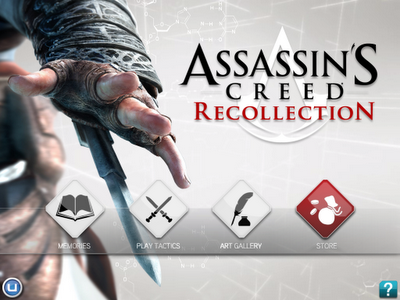 So, it is with this love of games, I want to share with you a rare gem that I have come across this evening... Assassin's Creed: Recollection for the iOS (iPad only). Openly and honestly, I only own the first Assassin's Creed video game. I loved it, but I never had the time to get into the others. I kept up with the franchise via online reviews and youtube, but I never had the chance to play them. The good thing with this, is that you don't have to know anything about the brand to enjoy it. AC:R is, at it's heart, a Collectable Card Game, but it's the gameplay and presentation that has caught me by such surprise that I must sing it's praises to you. I've played them all, Magic the Gathering, Pokemon (hey, I had a young kid at the time) Rage, Yugi, WoW, MapleStory iTCG (yes, that too), but nothing can compare to the true unique presentation and gameplay that Ubisoft brings to us by taking advantage of the iPad's capabilities. If you are familiar with CCG/TCGs, then the formula will not surprise you. You have a deck (Your "Sequence") and 50 cards in it (cards are referred to as "Memories"). If you have played the video games, this is where you see the influence. You start with a random 6 cards, as does your opponent. The goal? Control 2 of the 3 main "areas" through playing cards that gain you political power (from Agents) or influence (from Sites). Simple enough, there are three types of cards. Agents, Sites, and Actions. Agents represent Allies who use their political power to “campaign” for an area, or battle other opponent Agents. Sites provide places in the game you control to gain influence which is added to your political power. And Actions are just that, cards, or rather Memories, that come into play and have an in game effect. All this sounds very similar to other card games right? Well, here’s where it get’s interesting… each player is playing at the same time! Yes, the same time! Ubisoft calls it a Real Time Strategy Card Game and while it’s a mouthful to cay RTSCG, it hits the nail right on the head! As you are playing your cards using the gold you have at your disposal, your opponent is doing the same thing! How can this be though right? Card games have turns! Don’t they? They do. And this one does to. In fact, it’s called a “Half Day”. As you play, there is a “timer” like cursor moving from left to right that when it hits a certain point, a “Half Day” completes and you gain an additional gold and draw a new Memory from your Sequence. When you play a card from your hand into play, it takes a “Half Day” to come into play, and materializes (as a memory should) over the course of time. This means both you and your opponent can play an Agent, and while they are materializing, gain more gold, and plot strategy as to where to deploy them. The simple unique idea that you can play a game like this at the same time is amazingly cool and well presented by Ubi. One of my personal challenges with any card game, especially with Deck Building Games, is that a times, when it is someone else’s turn, you feel like you are waiting and waiting, only to have your turn and potentially not have much strategy at all about what you play or what you do. AC:R completely throws that issue out of the window, and turns a normal casual style card game into a fast paced thrill ride with everyone acting and something always happening for you to assess and strategize about! Plus, at $2.99, it’s a steal. Of course, you can buy more cards, I mean, they aren’t out to not make money right? But even the “Sequence” manager (Deck Builder) is amazingly well put together enough to make you want to have more cards in your collection to look at, and of course, play. Speaking of looking, the artwork is tremendous. It has a total Assassin’s Creed feel and a is extremely well detailed. My hats off to the art department on this one. Overall, it’s rare an iOS app thrills me, but this is just too much fun not to share. With great graphics, great soundtrack, a bonus 20 minute movie on Ezio, and amazing gameplay in single player story or multiplayer fun, this is a steal of a deal and one that will have making your own “Memories” for quite some time! Oh, and yes, you can play multiplayer (feel free to add me, my Game Center Name is Tox219)!